How does one actually write an invoice? To avoid any misunderstanding or other issues with the invoices your business issues to clients, it is important to understand how invoices should be structured and what information they must include. This chapter will discuss what an ideal invoice looks like, so you can use it as a reference when you’re preparing your invoices. The following sub-sections will provide thorough explanations of each of these elements. This is pretty straight-forward – the top part of your invoice should feature the logo of your business. This makes the invoice look professional (it is professional, after all) and will make it easier for the client to remember who you are straight away. Make sure that the logo image you include on the invoice is of high-quality and not too small so your logo can be discerned easily. The logo is usually aligned to the left (if the language of the invoice is written from left to right – English, for example) or to the center. 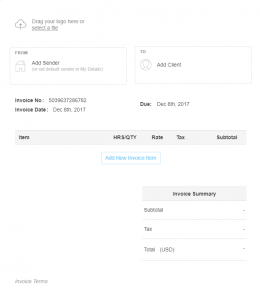 The sender’s name and contact information appear at the top of invoice underneath the logo and are usually also aligned to the left. The sender’s name (which is usually the name of your business or a representative from your business) should be followed by the business’ address, telephone number and email. Depending on the country or jurisdiction, you may be required to include other details, e.g. your VAT number (businesses in Europe are required to include VAT numbers if they’re VAT registered). The client’s contact information follows the sender’s contact information. This information might appear underneath the sender’s contact information or right beside it, on the right-hand side of the invoice (again, according to the direction of the language). It should include the name, address, phone number and email of the business or person you are invoicing. Please note that if you are invoicing a company with multiple offices and representatives, you should specify the person and/or department the invoice is intended for. When preparing an invoice, you should not neglect including the invoice number and date. These details are incredibly important as they reduce the chance of the invoice getting misplaced, as well as any misunderstanding on the side ofthe client regarding the payment deadline. 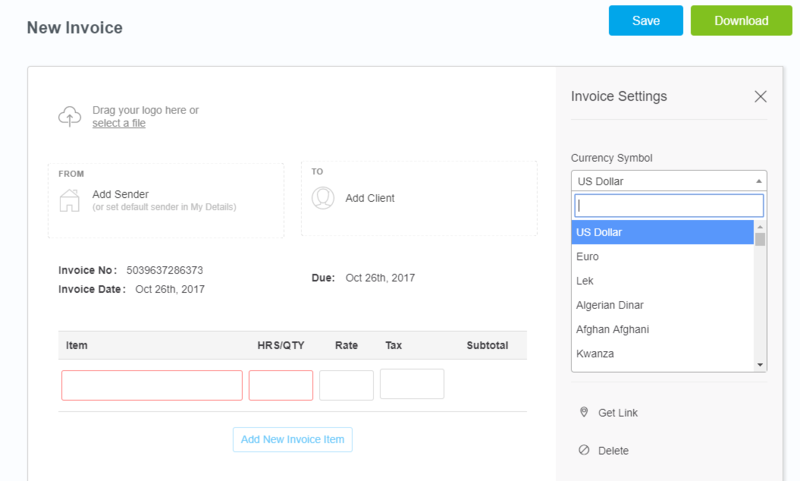 Invoice Number – The invoice number is its unique ID and can be referenced to when corresponding with the client or other relevant entities. Some businesses only use numbers (00001405), while others incorporate letters in the number for easier reference, e.g. the month, the client’s name, etc. (2017-9-WAL-008, standing for “eighth invoice for Wong & Associates Law Offices in September 2017”). Invoice Date – The invoice date is the date the invoice was issued. Usually, it is also the day the products or services were purchased. Even if the invoice number includes the date, the invoice date should still be written in a separate line. Due Date – The due date is the date by which payment must be made. The payment period is sometimes agreed on by both sides in advance; if no such agreement has been made, it is customary to determine that date by the standards in your industry. Common pay-by periods are 14, 30, 45 or 60 days. Huawei Nexus 6P Smartphone – Matte Gold or CBT Therapy Session>. Quantity –This should state the quantity the client purchased of the respective service, i.e., the number of phones purchased, the number of therapy sessions provided, etc. Rate – the price you are charging for the product/service. Subtotal – This column lists the subtotal for each item, which is the product of quantity multiplied by rate. These are the basic columns which should appear on every invoice, however, you may add more if necessary: Hour, if the service is billable by the hour; Date, if the date on which the service was provided is of importance; and so on. The invoice summary should appear right under the itemized breakdown of services. It sums up the subtotal of all items, so the first line should be titled “Subtotal”. Under the subtotal, a line named “Tax” will specify the amount added by the tax (if there is more than one tax added, each different tax should be titled appropriately). The final line of the invoice summary is reserved for the grand total and should be titled appropriately – “Total”. The total is the final amount the client should pay you, so it is extremely important to double-check it and make sure there has been no mistake in your calculations of the different services and the taxes added. The last part of the invoice should mention which methods of payment are accepted by your business: check, PayPal, credit card, money transfer, etc. and provide further instructions, if necessary. You can mention any other information you deem important, such as your return policy, the interest on late payments, etc.